My start to the day was a walk round Alney Island Nature Reserve with Monty, then we bade farewell to Marilyn and David on Waku Huai - David was hiding somewhere! Whilst the rain had not arrived yet it was not warm enough for a swim! They are heading back to Worcester, but will be there for a while, so we may catch up with them again. 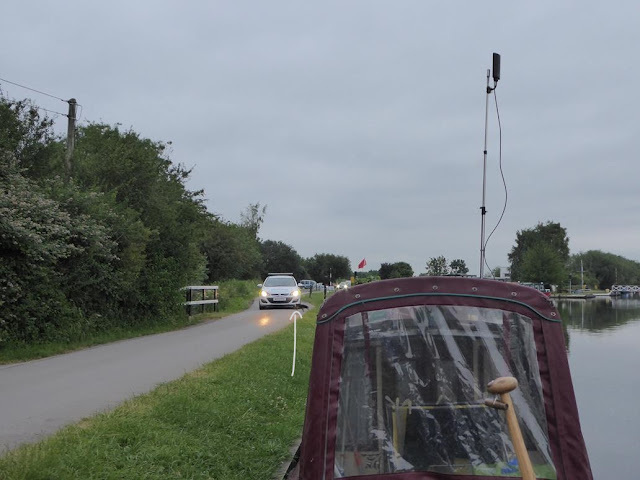 Our first stop was just a few hundred yards down the canal at the water point which was made more interesting by having to work round men at work – in the end they kindly took a coffee break and let us continue unimpeded. In the ordinary way of things that would not have been a problem, except they moored at Sainsburys not leaving enough room for us to fully moor – just one ring back and all would have been well. Were they there to shop? No, just for an engine service! We managed to secure ourselves sufficiently so we could go in and make the most of a shop where you can wheel the trolley to the boat. Whilst we were there Chris noticed that there is an Argos store at the back of this Sainsburys. A catalogue was collected for our perusal. What might you wonder were we after? Well, just over a week ago our television died – one minute it was fine and the next it was dead! We need a television that is the same size and that works with the swing out arm we have as the TV lives in a cupboard. We would have managed quite well until we got home, but with an Argos so close we thought we should see if they could help. The answer is yes they can, so I ordered one on line and we will collect it on the way back. A cocktail stick has been broken to make the third breakage (camera and TV) and we hope that is the end of our run of bad luck. Fully provisioned and we were on our way. You don’t often see steam powered craft – you could smell the coal smoke! There are no locks on this canal – just a succession of swing/lift bridges that are operated for you by bridge keepers. Where we found a most unusual craft complete with a couple of pirates. For Monty’s walk we followed part of the route of the Stroudwater Canal. We did not do the round circuit that Patrick and Angela (nb Chouette) took us on two years ago as we were not 100% sure of the way. It is a very pleasant walk with a lot of contrasting scenery. There are plans afoot to restore this canal. Sadly, this lock was replaced some time ago and has become overgrown again. The forecast was dire for today and we certainly woke to heavy rain. We had made the decision to stay put and have a ‘pottering day’. As it turned out the rain did stop, but it was certainly cold, grey and miserable. Apart from a couple of Monty walks between the showers I caught up on the blog and a few domestic chores and Chris did some jobs with varnish and then did some rope whipping. 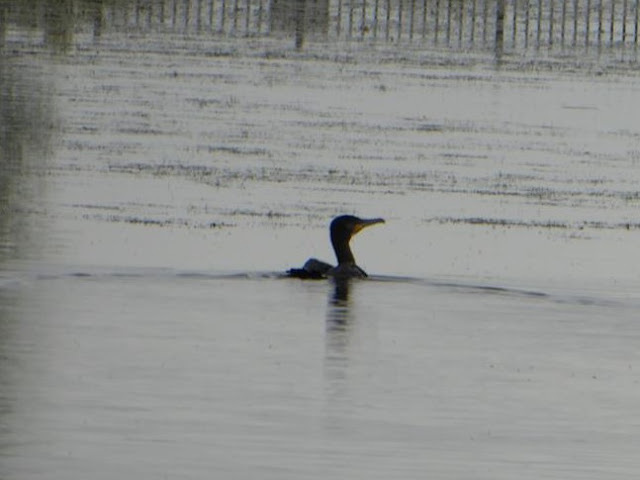 The highlight – well just the one – two weed cutters came past mid-afternoon! That, we thought, was that. Well it was until about 20:30 when we became aware of a very persistent police helicopter circling above the canal. Then a police car arrived and two PC’s got out and ran across the bridge. 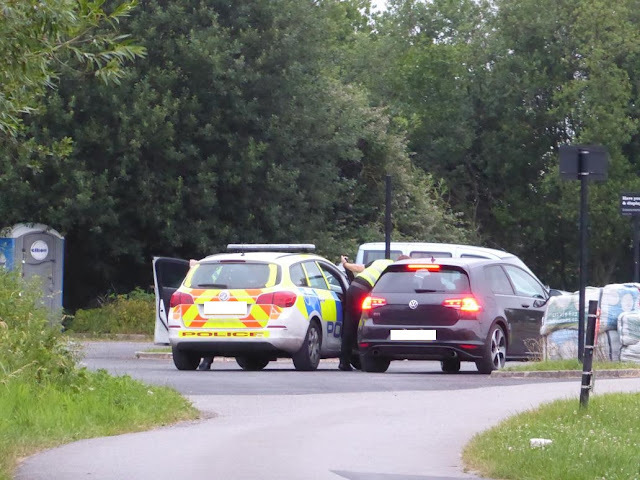 They returned to the car and left – I am glad to say that despite being occupied and in a hurry the driver noticed the little dog (white arrow) and managed to stop as it ran across the road in front of him. The car went to the next bridge along and drove down the tow path on the other side and the PC’s got out to resume the hunt. Another couple of cars arrived to join in the search. It was obvious they were looking for someone – was it someone on the run? We found out later that it was someone who was threatening to drown themselves in the canal. We don’t know the outcome, but as things went quiet we hope they were successful and that the person was found and given the help they needed. Another very grey and dismal day, so unlike the weather when we were here two years ago. The views along this canal are far reaching, but the grey cloudy skies do not do them justice. Yet more swing bridges – most of them are electronic and all the gate keeper has to do is push some buttons. A couple, however, require a bit more effort! I really do hope the owners of this boat do come from Peckham! And here we are at Sharpness (the end of the line) about to wind (turn around) before finding a mooring for the night. The Upper and Lower bridges that lead to the tidal Severn – we are not going that way this time. To be honest even if we had planned on doing so, I think the weather would have held us up as you need a good, calm, wind free day. Another time maybe – who knows? As you wind there is an arm leading down to an old sea lock. The arm is now used for private moorings. Just as we moored this happened!! Inside for lunch and to try and warm up. Neither of us remember this, so we suspect it is new. It is certainly huge and dominates the area. 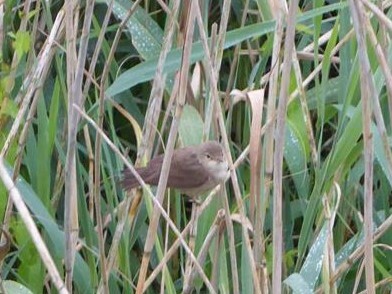 And a couple of these tiny Reed Warblers??? I am sure someone will tell me if I am wrong. Dinner was eaten to the accompanying sound of rain beating down on the metal roof - not the most melodious of sounds and as I type this at 21:00 it has not ceased for several hours. Hopefully tomorrow will be better as we start our return journey. Gloucester had confirmed that the 9 metre high tide had not wreaked too much havoc, so we were cleared to leave Tewkesbury as the lock opened after lunch at 14:00. nb Manhattan was to travel with us - so much easier to have two in the lock and a degree of comfort for both boats once on the river having someone within hailing distance if things did go awry. Manhattan led the way. For a part of the river that is non tidal this shows that there was quite a tide today! The water, however, was very brown - Chris said it was like sailing through liquid chocolate! Just over two and a half hours after we left Tewkesbury the wall outside Gloucester lock hove into view. If the lock is not ready you have to moor up to the wall to wait. The current is such, however, that you have to moor the stern first and the bow will then be pushed in to the side. Do the bow first at your peril! No such problems for us this trip as a wide beam was already in the lock, so it was ready for the two narrow boats to go in behind. We fought the wind and tucked ourselves into the corner, but what is that on the quayside this side of the white C&RT van? and so it proved to be - something we would have to investigate the next day. A while back I mentioned that my camera shutter was not opening and closing properly - well things reached crisis point on the journey from Tewkesbury when it failed completely. A focus error message was displayed and that was that. I resorted to Chris' camera which I am not used to. It is old and it is almost impossible to see what is on the screen in even the slightest bit of sun. It does, however, still take good photos, but I really needed to replace mine, so the first job was to find The London Camera Exchange and see if they could be of assistance. I wanted the same make - Panasonic Lumix as I have two good batteries and a charger, plus the fact that I understand how it works. They came up trumps with the TZ70 - one up from my previous TZ60. There are two above that - the 80 and 90, but they take much larger batteries. I have to say they were very helpful and I came away very happy and my first picture - well it had to be of the store! We had made one diversion on the way to the camera shop - into the Tourist Information Office. We needed a map of Gloucester and we also hoped to find out about that pig by the docks. We were not disappointed on both counts. So why a pig? Well not just one pig - there are 31 of them! Most are in the city centre with a couple more in the M5 service area and the final one is at Adam Henson's Cotswold Farm Park. They are all associated with the Three Counties (Worcestershire, Gloucestershire and Herefordshire) Show. An annual event that takes place at the Malvern Show Ground. This year they were celebrating the Gloucester Old Spot pig that Alan's father was a champion of when he opened the Farm Park in 1971. A tradition that Adam has continued. So how many did we find - well just nine. We loved them and may well go looking for some more when we return on our way back from Sharpness. After the successful camera shop we wandered in to the Eastgate shopping centre which has a market at one end where we came across a stall selling loose herbs, spices, olives, Turkish delight and many other middle eastern goodies. I failed to take photos - we were too busy tasting olives! We came away with two mixed spices to coat chicken (we have tried one and it is very good), some blades of mace and a small pot of olives, oh and two pieces of pistachio Turkish delight. It is only two years since we were last here when we visited the Cathedral, The Tailor of Gloucester and spotted other sights worth visiting. If you want a reminder please look HERE. I noted then that we did not get to The Soldiers of Gloucester Museum and the Folk Museum, plus we needed to return to the Waterways Museum. I afraid we failed on all three counts, so will just have to come back again - no hardship I can assure you. A return visit was made to the Mariner's Chapel - a place of such serenity it is a joy to visit. It is almost incongruous situated as it is among the warehouses. There is a leaflet inside that gives details of some 're-ordering work' that they have planning permission for. This is the first major work on this iconic building for many decades. They are adding a disabled toilet, a kitchen area, storage cupboard, new lighting & heating, carpeting and seating (moveable, stackable chairs). I guess that means they will lose those lovely pews, but the idea is to make a more flexible usable space more suited to the 21st century. The total cost will be £86,000. I cannot believe we missed either (the second is right by the mooring pontoons), so have to assume they were put in after 2015 as a memento to their 'big year'. One of the mainstays of our life is Monty which means at least two good walks a day. Whilst we love the moorings in Gloucester the challenge they present the dog owner is finding grass first thing in the morning and last thing at night. The nearest we have found is about a 5 minute walk from the boat, no problem for us, but does demand some dog leg crossing first thing in the morning! I lost count of the number of times we went there, but on one occasion Monty and I did the full circuit, which was actually shorter than when we did an out and back. Even if you don't have a dog it does make for a very pleasant walk. Pictures can be found in the link to the 2015 blog post above. All good things come to an end and it would be time to move on the next day. I like it when a plan comes together!